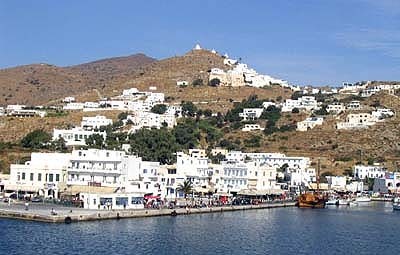 Departing for Paros, our ferry moves away from the quay and motors slowly across the caldera of the Theran volcano. With all the ships coming and going, I expect the speed limit within the harbor is strictly enforced. 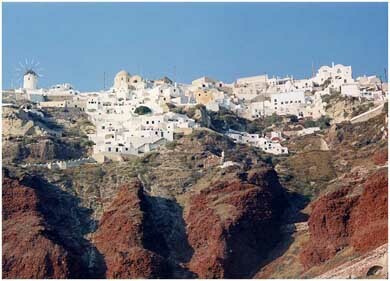 At the northern end of the island we pass beneath the town of Oia perched on the rim of the volcano. 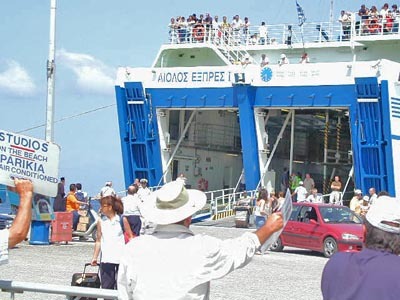 The ferry navigates the channel separating Thera and Therasia, and then accelerates into the open sea and towards the heart of the Cyclades islands. The route takes us first to Ios, an island about halfway between Thera and Paros. 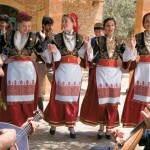 Ios is the reputed resting place of one of the world’s greatest literary masters – the Greek poet Homer, creator of the Iliad and the Odyssey. However, it is now more famous (or notorious) as a party island, a favorite of college students in search of summer fun. I watch the stony coast glide by as we near the island, thinking it looks rather bleak. The ferry goes around a point and into Ormos Iou (Bay of Ios), which is the most protected anchorage on the island. We are a bit confused when we first sight the port. This is the main port on the island, and we expected to see a town. There are only a few buildings along the quay and some scattered on the rocky hillside. The capital town is two kilometers away and nearly out of sight. In ancient times, Ios (or Nios, as it is called by natives) was covered in oak forests and had a thriving ship building industry based on its timber. 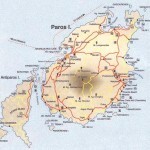 Sadly, the quest for wealth deforested the island and – in the end – impoverished its people. In recent decades, islanders promoted their unspoiled beaches and rebuilt their economy around tourism. Our ferry pours out a new batch of rowdy tourists, and I wonder how long the beaches will remain attractive. Leaving Ios, we continue into the Cyclades. As we exit the bay and turn northward, I can see nearby Sykinos – a quiet island that has more donkeys than cars. 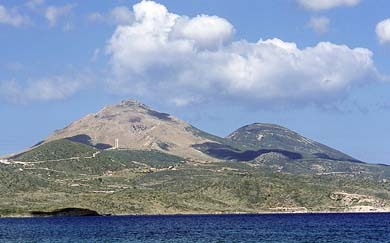 To the west are the volcanic islands of Mi­los and Ki­molos; farther north are Si­fnos and then Serifos, was turned to stone when the legendary Perseus returned with Medusa’s head to rescue his mother (read The Quest). As we approach Paros, the ferry steers toward the unpopulated western coast of Antiparos. This is the safe route, because the shallow channel between Paros and Anti­paros is too dangerous for ferries. 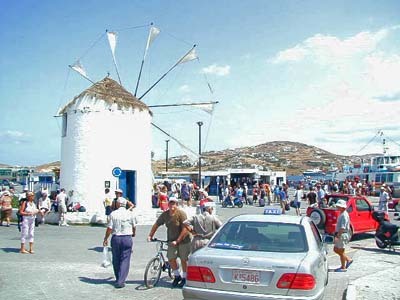 At the northern tip of Anti­paros, our ferry turns eastward into the main shipping lane, and then into the harbor of Paroikia, capitol of Paros. This port is the crossroad for most ferry traffic in the Aegean Sea. Sometimes there are three ferries at the dock, off-loading and loading passengers and vehicles, while others wait offshore for their turns. When we go ashore, another ferry has already disgorged a herd of travelers – all dragging heavy luggage across the quay towards packs of placard-waving touts shouting the merits of whatever hotel or domatia (rental rooms) they represent. We make our way through the crowd to a sidewalk cafe near the port windmill. After ordering coffee frappes, we telephone our friend Lambis to announce our arrival. Our iced drinks are only half-finished when he drives up, grinning. We should have waited to call call, because his business is only a few minutes away from the harbor. After warm greetings, he unceremoniously tossed our backpacks into his VW van, and we are off. 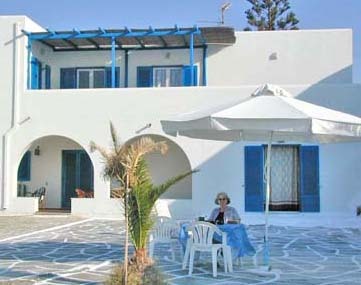 It is a short ride out of town to his seaside villa, and we are relieved to finally unpack in our apartment. Before long, Duane is napping so I take my book and a tall glass of iced water to the shade of an umbrella on the terrace.